A few weeks ago I wrote a post or two which mentioned the 1939 New York World’s Fair. 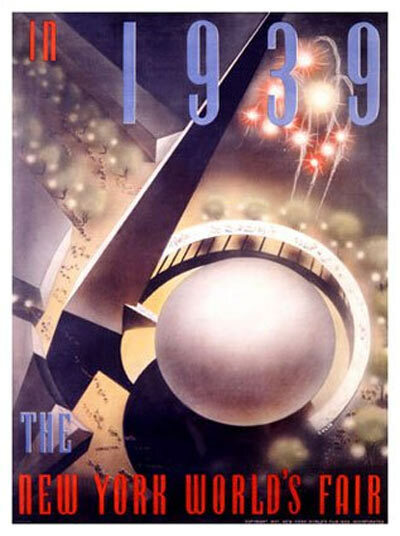 The ’39 Fair in particular caught my attention as a remarkable fusion of technology and modernism in the service of a utopian vision of the future. But the ’39 Fair is only one of many Fairs and Expositions held in the US and around the world since 1851, the year of London’s Crystal Palace Exhibition. It’s quite likely that you’ll be hearing a bit more about these fairs, particularly the ’39 Fair in the coming weeks. They are fascinating historical snapshots capturing at once the past, present, and hoped for future. Many of the fairs included a retrospective look back at the culture’s achievement. For example, the 1876 Philadelphia Fair explicitly remembered the first 100 years of American history following the Declaration of Independence. The fairs also look forward to the future. This was most obviously the case in the ’39 Fair that took “The World of Tomorrow” as its theme, but it is an element of all the fairs. And, of course, in the way they remembered the past and the way they envisioned the future the fairs were perhaps above all else leading indicators of their own time. Historian Robert W. Rydell has made a career out of telling the story of the World’s Fairs and Expositions, especially those held in America. In the Introduction to All the World’s a Fair, Rydell provides a useful frame by which we might approach the significance of the Fairs. Perhaps not surprisingly, many of the fairs were held during times of severe economic and social strain. The ’39 Fair, coming years after the Great Depression had been in full swing, is only the most obvious example. In fact, the most striking feature of the present period of economic difficulty considered in light of the past 150 years may be the absence of a World’s Fair. I suspect that we are now too knowing and ironically self-aware to take something like a World’s Fair seriously. The mythic aspect of the fairs has been significantly paired down into a theme park experience. Consider Disney’s Carousel of Progress the hinge. It debuted at the 1964 New York World’s Fair before making Disney Land its home. Subsequently, EPCOT has functioned as a kind of permanent World’s Fair. Finally, one more item for all of those interested in a bit of cultural archeology. Below is a 50-minute film prepared by the Westinghouse Corporation for the 1939 Fair. The film is fascinating at a number of levels. I’ll leave it to you to watch the whole, but here’s a very brief synopsis. The Middletons are an average American family who have come to New York to visit the Fair. The daughter, who had been living in New York, is now involved with a socialist, anti-American art professor. At the fair, she runs into her old flame, a clean cut, All-American engineer working for Westinghouse at the Fair and determined to the defend the American way of life. Enjoy. See also: The World of Tomorrow, Inc.